Knopf Publishing Group, 9780385354127, 240pp. From the critically acclaimed author of "Atlas of Unknowns" and "Aerogrammes," a tour de force set in South India that plumbs the moral complexities of the ivory trade through the eyes of a poacher, a documentary filmmaker, and, in a feat of audacious imagination, an infamous elephant known as the Gravedigger. Orphaned by poachers as a calf and sold into a life of labor and exhibition, the Gravedigger breaks free of his chains and begins terrorizing the countryside, earning his name from the humans he kills and then tenderly buries. Manu, the studious younger son of a rice farmer, loses his cousin to the Gravedigger's violence and is drawn, with his wayward brother Jayan, into the sordid, alluring world of poaching. Emma is a young American working on a documentary with her college best friend, who witnesses the porous boundary between conservation and corruption and finds herself in her own moral gray area: a risky affair with the veterinarian who is the film's subject. As the novel hurtles toward its tragic climax, these three storylines fuse into a wrenching meditation on love and betrayal, duty and loyalty, and the vexed relationship between man and nature. With lyricism and suspense, Tania James animates the rural landscapes where Western idealism clashes with local reality; where a farmer's livelihood can be destroyed by a rampaging elephant; where men are driven to poaching. 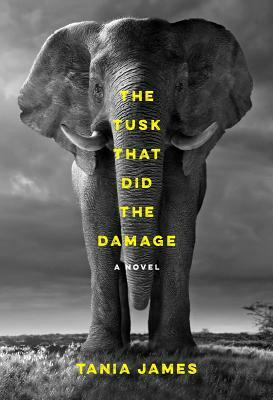 In James arrestingly beautiful prose, "The Tusk That Did the Damage" blends the mythical and the political to tell a wholly original, utterly contemporary story about the majestic animal, both god and menace, that has mesmerized us for centuries. TANIA JAMES is the author of the novelAtlas of Unknownsand the short-story collectionAerogrammes. Her fiction has appeared inBoston Review, Granta, Guernica, One Story, A Public Space, andThe Kenyon Review. She lives in Washington, DC."